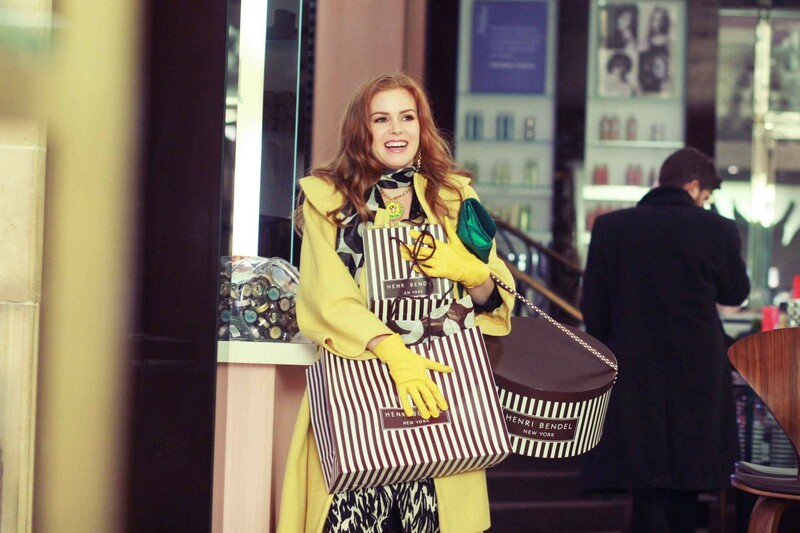 Her name is Rebecca Bloomwood (Isla Fisher), and she is a shopaholic. Although P. J. Hogan’s Confessions of a Shopaholic could have started that way, the film takes a subtler step. We begin as Rebecca is trapped within a vicious cycle of shopping and ignoring her credit card debts. We follow her as she tries to overcome her addiction and shape a unified Self that doesn’t rely on materialism. So, the lights go out, and the audience witnesses the world through Rebecca’s point of view. Instead of using the adult Rebecca as a lens, however, Hogan goes deeper into her childhood, during the process of identity formation. In this way, Rebecca’s addiction is framed as a core personality trait. “When I was seven, most of my friends stopped believing in magic. That’s when I started” says Rebecca and in doing so it becomes transparent that she has bought into consumerism’s narrative: material possessions are the basis of happiness. Rebecca defines shopping as “magic” because she perceives it as a process of transformation, during which the consumer decides upon a given identity, and a magic credit card realises that dream. The film is essentially presenting the essence/phenomena binary, and Rebecca favours the latter. It is safe to say, therefore, that Rebecca has a distorted sense of reality that circles around the issue of materialism. It should be noted here that the film’s title, Confessions of a Shopaholic, creates a certain expectation: the noun ‘confession’ denotes an admittance of guilt, and therefore connotes that Rebecca’s shopping habits are self-destructive. Hence, the film sets itself up to be a critique of consumerism. As the plot progresses, however, the film ends up reproducing the very concept it’s trying to criticise. Despite that, certain elements of the film’s objective are successfully implemented in the plot, such as Rebecca’s portrayal as an addict. As a child, Rebecca dreamed of the day that her financial status would provide her one of those “magic plastic cards.” Thrown into the present, she has 12, none of which she can afford. Again, this information is unveiled through a building crescendo. Rebecca introduces herself by giving out her name, her profession, and an excruciatingly detailed description of her outfit; a combination of designer clothes. In this way, Rebecca constructs an identity of a successful and wealthy career woman. It is only her subsequent panicked reaction to her bills that brings to the fore Rebecca’s addiction; her constant need to shop obsessively. It’s a compulsion that has taken hold of her life to such an extent that she neither remembers all of her shopping escapades, nor which narrative she has constructed for each one of her debts. In an almost hypnotic state, Rebecca is trapped by the “siren call of the store window.” Compared to a siren from Greek Mythology, the stores lure Rebecca to her downfall. Rebecca, however, doesn’t seem alarmed by her urges; she argues that everything is under control. Under the impression, or delusion, that she can end it all in an instant, Rebecca is a realistic depiction of an addict in denial. Thus, when her best friend Suze (Krysten Ritter) buys her a tape on how to overpower the overwhelming need to shop, Rebecca doesn’t follow the steps. The tape’s first step, for instance, is to “de-clutter” her room. As it is evident in the image above, Rebecca is drowning among her belongings; she’s trapped and there’s no way out. Rather than “de-cluttering” her room, however, Rebecca places everything in storage compression bags, and hides it in her closet. The problem, therefore, is not faced, but buried deep into her wardrobe in order to be forgotten. Out of sight, out of mind. Rebecca lies to Suze later on about cleaning out her room, pointing out her shame, which in turn translates into the reality that her lifestyle is unhealthy. In these moments, the film’s critique holds together. The discrepancy between Rebecca’s distorted view of the world and her environment outside the Dane West company demonstrates the absurdity of materialism. After Rebecca’s credit card is “really declined,” she tries to get $20 from a guy who has a hot dog stand, by writing him a check. Rebecca’s argument that the $20 bill is vital for her purchase of “a desperately important scarf” is repeated by the hot dog stand guy to highlight its ludicrousness. That nameless guy stands as the voice of reason amidst Rebecca’s illogical rant. Existing outside the film’s depiction of the fashion and business worlds, he brings to the fore the issue of class; a $120 scarf cannot be deemed “desperately important” because it’s not central to one’s survival. Hence, the man’s scorn of Rebecca advocates the audience’s scorn; we’re encouraged to laugh and thus the film’s critique works at this point. While the class issue here is used as a standpoint to criticise consumerism, its reemergence later on is somewhat questionable. Rebecca’s progress in overcoming her addiction is evident in her upcoming attendance to a Dane West company ball. Influenced by Suze, she wears an outfit she already owns instead of purchasing a new dress. Rebecca, therefore, is slowly awakening from the “siren call of the window stores;” she’s shaping a Self outside the bounds of materialism. The true source of her inspiration, however, was her boss, Luke Brandon, (Hugh Dancy) and his comment “I don’t want to be defined by clothes or labels.” Again, the film takes a clear stand: material possessions shouldn’t determine who Rebecca is. At the ball, however, her old black and white dress defines her as a waitress, who is “adorable.” The adjective adorable here is used as a form of patronising by a wealthy woman. Considering that the dress has already been used for its purpose in the past and now has prompted Rebecca’s ridicule, the film’s argument is undercut. The dress marks her social Otherness; it has lost its value and thus Rebecca doesn’t belong there. Even if the incident is ambiguous, however, the critique still manages to hold its ground because the audience isn’t supposed to empathise with the ball’s guests. But, the overall message of the film fails to do justice to its original argument due to the green scarf; the only piece of clothing that Rebecca cannot break free from. The scarf’s existence in Hogan’s universe is problematic from the moment Rebecca sets her eyes on it. In a sentence of almost prophetic significance, a mannequin claims that: “the point about this scarf is that it would become a part of a definition of you, of your psyche.” In other words, this inanimate object will become part of the foundation of Rebecca’s identity; a concept that connects to consumerism. Coming from the ‘mouth’ of another inanimate object is supposed to render this argument ridiculous, and it initially does. Unfortunately for the film, however, the green scarf becomes Rebecca’s defining characteristic. Even if Rebecca is in the process of trying to “turn her life around” while working at Successful Saving magazine, she’s doing that under the pseudonym ‘The Girl in the Green Scarf.’ For this reason, Rebecca’s success is overshadowed by a fictional persona whose determining mark is a piece of clothing. This concept takes a visual manifestation as well. In the green scarf’s absence, Rebecca’s outfits always include something green (a belt, a top). While green, “the colour of money” as her Shopaholic Anonymous group leader calls it, becomes a permanent colour of Rebecca’s wardrobe, with the green scarf being the crowning jewel, the film’s critique is gradually falling apart. The last blow comes at the end. Rebecca’s sale is supposed to demonstrate her freedom from material possessions; she has finally “de-cluttered.” Instead, Luke’s purchase of the green scarf along with his repetition of the “it’s a desperately important scarf” line seals the film’s failure to criticise consumerism. Rebecca is and always will be the ‘Girl in the Green Scarf,’ and that is why the scarf takes the last few seconds of screen-time before the film’s credits start to roll. Overall, in terms of plot, Rebecca manages to conquer her addiction because shopping no longer navigates her life. Considering, however, that both her professional and her personal lives are tied and defined by a scarf, one can’t help but support that the film’s argument against consumerism gets lost somewhere along the way. With that in mind, Confessions of a Shopaholic ends up reproducing the very concept it’s trying to criticise. Ioanna is an English and American literature graduate from Greece. Other than her love of cats, Ioanna discovered her love of films around the age of 12 and has been using people’s taste in film to see if they’re cool ever since. Torn between her fascination with intellectually stimulating films/TV shows, and her love of all geeky and/or fantasy things, she finds it hard to pinpoint her favorite entertainment media. What follows is a semi-successful (?) attempt: Donnie Darko, anything Harry Potter related, Black Mirror, Lord of the Rings, True Detective, Freaks and Geeks etc.